You may know Ladakh as a remote Himalayan region, famed for its wildlife and trekking routes. For a thousand years, the land was ruled by Buddhist kings under Tibetan influence, who built formidable monasteries perched atop isolated scrags of rock, very popular nowadays with tourists. It was only in the mid-19th century that the (Hindu) Maharaja Gulab Singh invaded the region, which became part of Jammu & Kasmir, a princely state of British India. Despite its assimilation into the Indian republic, the two modern districts of Ladakh (Leh and Kargil) enjoy relative political autonomy nowadays, due to their cultural and religious differences with the rest of the state. Beyond its cultural and historical interest, what brought Slow Motion Projects to Ladakh is its ecological significance. As a high mountain region (most villages are situated above 3500m), Ladakh is a harsh and unforgiving place; its climate is classified as "cold desert", with temperatures reaching over 30°C in summer and under -40°C in winter. Crucially, extremely low precipitation levels mean that people depend on glacial meltwater to sustain their agricultural activity, traditionally centered around barley cultivation (in the world's highest fields) and livestock breeding (in particular yaks, very well adapted to the high altitude and harsh climate). For thousands of years, a regular pattern of glacial melt coupled with meagre summer rains allowed a stable population to thrive. Sadly, today's changing climate threatens the very existence of the Ladakhi people. Flash floods, such as the 2010 one that claimed 255 lives, destroy crops and settlements. Receding glaciers yield ever smaller quantities of water every year, further jeopardising the survival of crops and livestock. Alarmingly, we now understand the role of "black carbon", coming in large part from the burning of biomass in the northern plains of India, in creating a vicious cycle of global warming: black carbon particles deposit onto snow and ice, reducing surface albedo and increasing temperatures; in turn, higher surface temperatures lead to lower glacial cover and further decreased albedo. And if all this wasn't enough, the region is now at the heart of a tripartite geopolitical standoff involving India, Pakistan, and China, among the stakes of which is access to the rarefying waters of the Indus river, irrigating the largest land area of any river system in the world. Ironically, the people of Ladakh are among the first victims of a global change they did not create... Yet in the face of seemingly insurmountable odds, they are proving incredibly resourceful. The first public announcement of the creation of Slow Motion Projects, at TEDxGateway 2015 in Mumbai, was also an occasion for us to meet famed innovator Sonam Wangchuck. Sonam is a Ladakhi visionary determined, through education and innovation, to save his people from an environmental catastrophe. 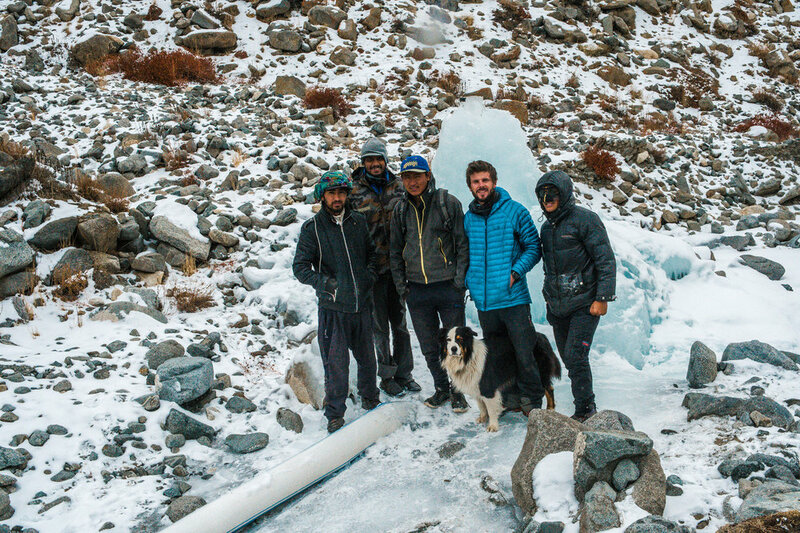 In the early winter of 2016, we spent a month working with Sonam's Ice Stupa team, whose aim is nothing less than to build artificial glaciers to solve the water crisis in the Himalayas. Similarly to our projects in Bhutan, the focus of this stay for Slow Motion Projects was skill-building and knowledge transfer, to help the local team in achieving their goals of environmental innovation. While stationed at the Ice Stupa camp in Phyang, a large chunk of our work had to do with data analysis and modelling, with a view to training the local staff. 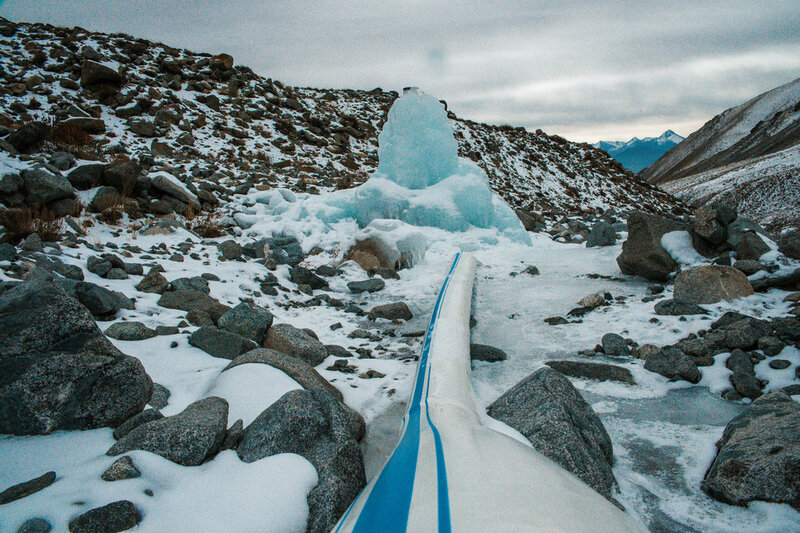 Fundamentally, an ice stupa is nothing but a big cone of ice that holds frozen water during the winter and releases it slowly during the spring and early summer, before the summer rains start. In order to optimise the growth of the ice formation throughout the winter and its melt in the spring and summer, it is crucial to understand how various environmental parameters influence the freeze and melt dynamics. Growth and melt of the ice stupa as a function of temperature; multivariate analyses are presented in the full report. We created a data processing pipeline to elucidate the effect of the different parameters measured by the Ice Stupa weather station: temperature, UV index, relative humidity, atmospheric pressure. Using machine learning algorithms (multivariate linear regression with elastic net regularisation), we matched these parameters to changes in the height of the stupa, measured from images snapped automatically at regular intervals. This allowed us to uncover informative correlations, but most importantly train the Ice Stupa staff in data analysis and modelling, so they can replicate the study on their own with data from the winter 2017 and beyond. To know more about this project, check out the details in our full report. A significant obstacle in the implementation of the techniques described above was the lack of data collected by the local weather station, due in large part to intermittent Internet connectivity (as is unfortunately the rule in Ladakh). We developed a set of tools to enable offline weather data collection at the Ice Stupa project, by fooling the weather station into thinking that it is online even when it isn't. This involved reverse-engineering the communication protocol, creating a proxy server, and setting up a fake backend server to communicate with the station. As a result, weather data can now be continuously collected, whether there is Internet connectivity in the region or not. Full details and a walkthrough of our solution are provided on the GitHub project page. Like Slow Motion Projects, the Ice Stupa project is supported mostly by donations. As Sonam Wangchuk started a large crowdfunding campaign to create an alternative university in Ladakh, an outstanding question was where the bulk of the donations came from. Are many small donations more important for the project than a few large ones, or the other way around? The answer to this question has to do with the shape of the statistical distribution of donations, which we analysed to conclude that a few donors contributed disproportionately large amounts to the first Ice Stupa crowdfunding campaign, thus influencing the fundraising strategy for the next phase. This study is also detailed in our full activity report. Sustainable solutions to fight climate change. We also taught evening "science classes" for the hands-on engineers of the Ice Stupa Project, covering topics such as the history of life, evolution, animal behaviour, complexity, and of course climate change. Mingyur Rigzen is a young Ladakhi who, after completing his studies at the SECMOL alternative school, realised that the last thing he wanted was to see his native land dry up, wither, and die. Aged 25 only, he has already become a successful eco-entrepreneur by growing and selling organic peas which no one thought capable of striving above 4000 metres. Leading the Ice Stupa field team in the winter and wildlife tourist groups in the summer, Mingyur slowly saved money and built, with his own hands, an ecotourism lodge in his small hamlet of Rumtse, on the road from Leh to Manali. But perhaps his most significant environmental achievement is the creation, with former school mates, of the "Youth Association of Gya", a small independent organisation whose mission is to empower other young Ladakhis in building a sustainable economy. The YAG encourages the development of ecotourism by training local youth, and educates the villagers on the importance of wildlife conservation. Just like Sonam Wangchuk, whose dream of a sustainably prosperous Ladakh might be slowly coming true, Mingyur Rigzen is sowing the seeds of the region's future through the most important empowerment vector of all: education. We have decided that Slow Motion Projects will further enable his action by supporting the organisation of a sustainability winter school at the end of 2017, allowing 50 local students to gather and incubate ideas about sustainable development for Ladakh... Watch this space for more information in the near future!